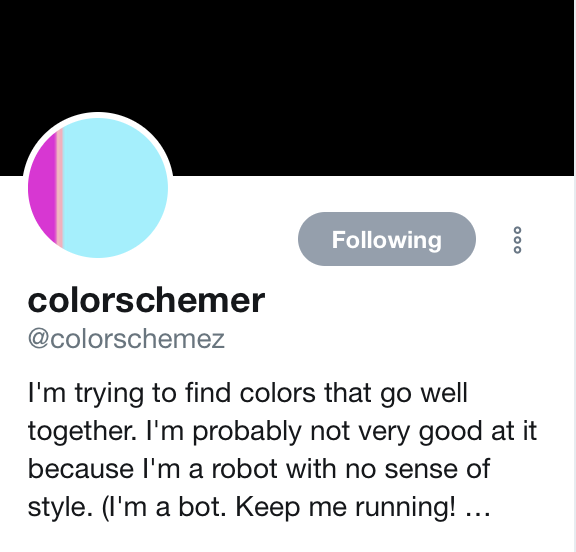 So, every hour this "bot" produces an image comprised of three colors that it thinks compliment each other. Genius! I find this fascinating, engaging and inspirational. As an artist myself, I'm always looking for new color combinations and the aesthetics of simple color planes. These images remind me of some of my favorite painters; Barnett Newman, Mark Rothko and Piet Mondrian. Combining a few of them into one image also brings about inspiration. I combined the three images above to create this gorgeous palette below. I love how these colors work together! I'm thrilled to have found this Twitter account and hope you enjoy it as much as I do. If you'd like to support the project, go buy something from creator joemfox.